If there is one thing that any traveller worth their backpack knows, some of the best eats in India can be found on the streets. Granted, in the country that produced one of the world’s favourite cuisines, there are an abundance of classy restaurants serving top-notch examples of modern Indian fare; but one of the best ways to taste classic, authentic and traditional Indian food is to hit the street stalls and roadside vendors that make a living from selling their sizzling wares. Forget streets paved with gold, Delhi’s streets are lined with food! However, one of the favourite street snacks of the people of Delhi might just be the innocuous looking momo. These tasty dumplings can be stuffed with all manner of fillings from chicken to paneer and either fried, steamed or baked. Not only delicious, but versatile, too! The speciality snack of Indore also makes a popular breakfast meal. Poha jalebi is a combination of flattened, puffed rice with hot, crispy, fried loops of golden jalebi. Garnish with crunchy sev and a sprinkling of pomegranate seeds and the meal is complete. Lakhnawi cuisine is an unmissable experience for the kebab-lovers amongst us. The meat kebabs this city is famous for are tender, spiced and char-grilled to succulent perfection. And it’s not just the carnivores that have all the fun – dalchar kabab, boti kebab and shammi kebabs are just a few of the inventive vegetarian versions of this snack. You can’t pay a visit to Mumbai and not sample the famous vada pav. This Indian burger consists of a crispy, spiced potato fritter, encased within a fluffy bread bun. You’ll never look at Macdonald’s the same way again. The crunchy prizes served up by the jhal muri vendor form one of the favourite snacks of Kolkata. 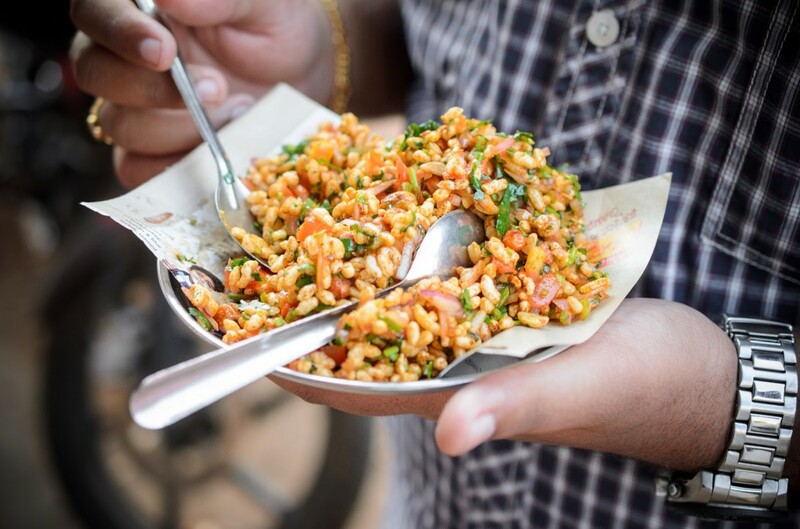 A newspaper packet of this popular snack includes puffed rice, chopped coriander, a handful of nuts, fried lentils and a sprinkling of red onion. Top it all off with a few squeezes of fresh lime and enjoy! Flatbreads are an integral part of the Indian diet and a wide variety of these delicious breads can be found on the street. Akki roti is a Banglore favourite and consists of a rice pancake, spiced and served with a creamy coconut chutney or a dollop of warm, melting ghee. Idli sambar reigns supreme on the streets of Chennai. These fluffy, little rice cakes, consumed with spiced sambar or a selection of accompanying chutneys, are also popular at breakfast time. You may be familiar with the deep-fried onion bhaji but have you tried the milagai bhaji? This deep fried chilli snack is one for the spice-lovers and this is the city that allegedly serves up the tastiest. To see the influence of these traditional Indian snacks, visit Veeraswamy – one of London’s best Indian fine dining restaurants – and experience its ever-changing menu that skilfully combines authentic, inspirational recipes with sumptuous style.